You are here: Home / Just to know / What is a General Congregation? In the 476 years since its founding, the Society of Jesus has convened only 35 general congregations. The 36th General Congregation will convene in Rome on October 2, 2016. A general congregation is always summoned on the death or resignation of the head of the Society — the Superior General — to choose his successor, or when the General decides action is needed on serious matters that he cannot or does not want to decide alone. The current Superior General of the Society of Jesus, Father Adolfo Nicolás, SJ, a native of Spain, announced in December of 2014 his intention to resign. Fr. Nicolás was elected in 2008 to succeed Father Peter-Hans Kolvenbach, SJ. Some congregations last for months — and one, GC 31 in 1965-66, met for several months, broke for more than a year, and resumed for two more months. 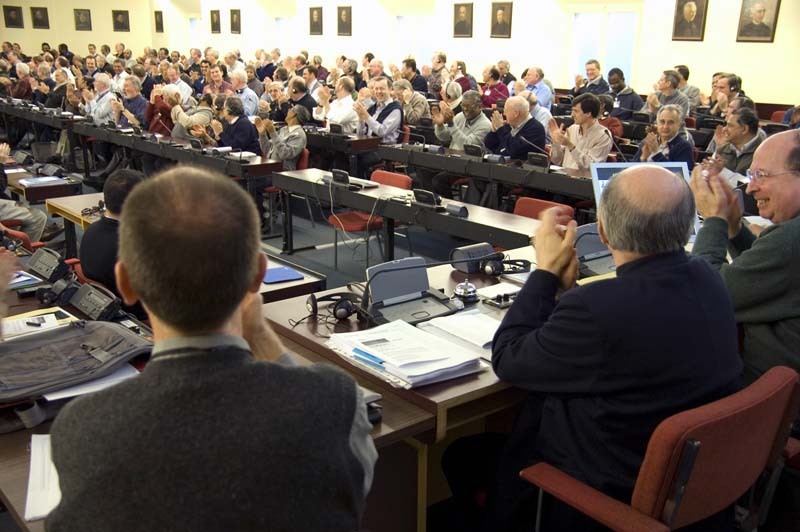 When it is in session, a general congregation (GC) is the supreme governing body of the Society of Jesus, outranking even the Jesuit’s Superior General. The first general congregation took place in 1558. It had been delayed for two years after St. Ignatius’ death because a war between King Philip II of Spain and Pope Paul IV. Father Diego Laynez, SJ, was elected Superior General. Pope Francis, a Jesuit, attended two general congregations — GC 32 (1974-75) and GC 33 (1983). In addition to electing a new superior general, GC 36 delegates will discuss postulata or petitions/requests received from province congregations. Not all postulates are accepted by the general congregation. The number of postulata sent to a general congregation usually comes to no more than several hundred, although approximately 2,000 postulata inundated the 31st General Congregation in 1965-66, as Vatican II unleashed the imagination of the Society. At GC 32 (1974-75), the “service of faith and the promotion of justice,” was established as the specific and overriding characteristic of all Jesuit works. On the logo, the IHS represents the Society’s boat in the church, and the waves represent the sea where Jesuits are invited to enter and row out into, toward frontiers. The cross represents the sail where the Spirit blows, helping the Society row. The flame above the cross represents “a fire that kindles other fires,” a link to Decree 2 from GC 35 on rediscovering the Jesuit charism.